On the 4th of July we celebrate freedom, food, and fireworks, but for runners this year we also celebrated the freedom to run. I began my holiday celebration by running 5 hot as a fire-a-cracker miles. As I approached the starting line the traditional protocols where in place such as the singing of the National Anthem, but today the song had just a little more meaning since it is the 4th of July and we are celebrating 242 years of freedom for the USA. 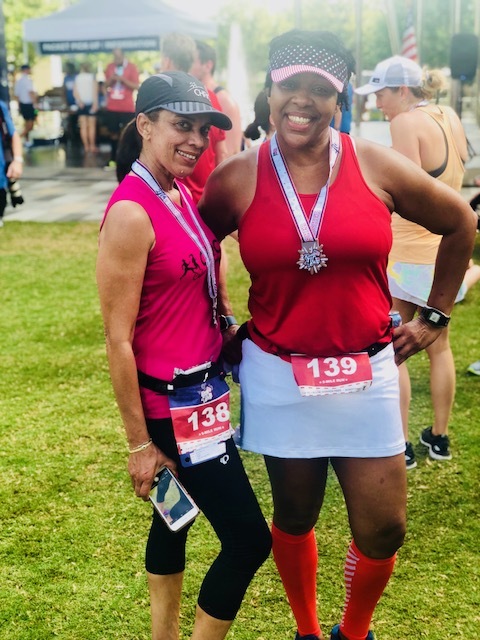 As you looked around you saw runners dressed in all types of patriotic attire, from flag shorts, to tank tops, tights, visors, actual American flags, and a sea of red, white and blue. The song is over, Mr. Paul Lambert, Race Director, has given us some words of encouragement, and the energy is high. There’s only one thing left to do, RUN! This race had something for everybody. If you are a novice or elite runner then it offered a 5 mile run. The route was a mixture of flat pavement, inclines, and full hills. Which I really enjoyed because I like a challenge, who has time to get up early on a holiday for an easy course? Not this runner.. Also, let’s take into consideration the more challenging the course the more calories burned, which means I can eat, drink and be merry for the reminder of the day. Not quite ready to run or walk 5 miles, or you want to bring the little one and a stroller, or maybe you just need to get your steps in so you can win the fitbit challenge (I don’t know how we ever made it without tracking our steps), then the 2 mile walk would be perfect for you. The 2 mile walk started 45 mins after the 5 mile run which was great because then no one feels intimidated by the elite runners, and the other runners didn't have the frustration of the weaving between strollers. Now, I did see a couple of strollers on the 5 mile run but I can’t complain because their pace was better than my pace, (maybe I need to get me a stroller, don’t worry next year my granddaughter should be ready to join the party). I did say this race had something for everyone so you guessed it, they offered a 2 mile walk for the dogs (our fur babies). The 2 mile dog walk started with the 2 mile run which was perfect. The race description for our fur babies emphasized well behaved fur babies so that meant I had to leave my fur daughter Kyla at home. To make it even more special the fur babies,(meet AJ and Franklin) also received race swag, that included a race bib, bandana, and a finishers medal, AWESOME! Just when you thought it couldn’t get any better the clock struck 10am and the announcer called for the kids race. What? there’s more… I thought the kids/strollers ran with their parents, but no they had their own race experience. As the children lined up to run 100m, 400m, or 800m you could see the excitement in their eyes and the competitive spirit in the older kids. On your mark, get set, go, and off they went some by themselves and some like Jaxx Fitts with pacifier in mouth, needed any extra push (no stroller) from mom (Tara), but he finished on his own, upright and happy. Some of the bigger kids loved it so much that they crossed the finish line did a u-turn and ran it again. I just love to see kids moving!!! The temperature was already a hot and humid 87 degrees at 8am when the race started. Due to the heat, hydration was a must and there was adequate water stations along the route but smart runners also carried hydration with them (I wasn’t a smart runner). Although the sun was high in the sky and the temperature was raising the route was really shady which was definitely a plus. At the finish line there was a little surprise twist for hydration, WATERMELON! 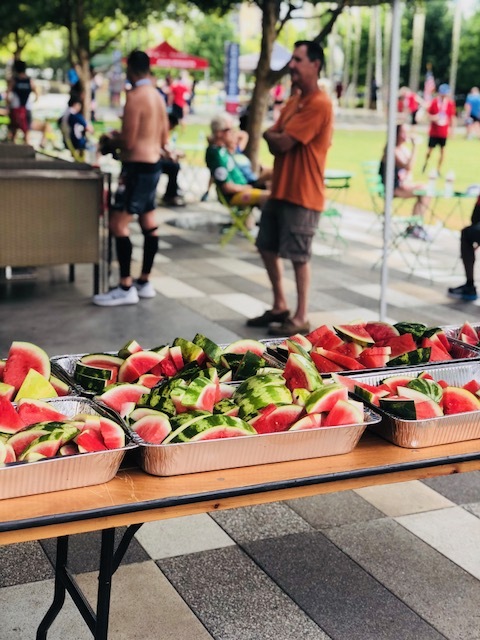 In addition to regular H2O, there was a table of quarter sliced sweet and refreshing watermelon(I think they read my blog on how to beat the heat). This added touch made the race feel more like a family affair because you saw runners and their families sitting on the lawn, some with blankets enjoying the watermelon, music and some adult hydrations sponsored by Samuel Adams. Not only was there a twist with the watermelon but there was another twist, the medal or can you say medallion. The medallion was a great design of the race logo, the twist was it was rubber instead of the traditional medal. Some runners found this to be less than their expectations for bling but I thought it was different, practical and nice. The thought that crossed my mind was the medallion was also given to the kids and the fur babies, so how safe would a sharp and heavy metal be for them. I can’t say enough about this race, but don’t just take my word, grab your entire family, mark your calendar and sign up for the 5 on the 4th 2019, you will not be disappointed.